One of the world's highest paid YouTubers PewDiePie is in serious trouble again. He used a racist word which is incredibly insulting towards black people whilst live streaming himself playing a game. He has more than 57 million subscribers on YouTube and last year earned more than £11 million through the site. PewDiePie's real name is Felix Kjellberg. He's a 27-year-old from Sweden who built a huge fan base creating videos, mostly about video games. After forgetting the password to his original channel he sets up PewDiePie. Little does he know that this will become the most subscribed YouTube channel in the world. The very first video was posted where he played Minecraft for two minutes without any face-cam. His channel is still to date the most popular with nearly 57 million subscribers. He was voted most popular gaming web star at the 2014 Teen Choice awards. He was removed from the site for a short time after he told followers that he and fellow YouTube star Jacksepticeye had joined Islamic State. Twitter shut down his account, according to their rules on promoting "organisations or individuals associated with promoting hate". He used a racist word which is incredibly insulting to black people. This created an explosion of criticism on social media, where fans claimed the star's words were unacceptable. 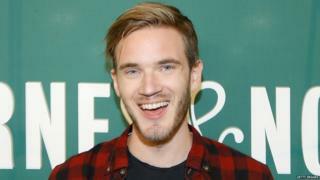 Disney cut PewDiePie from their network after more controversy and criticised for telling an anti-Semitic joke. The decision came after several videos he released over the past few months were found to contain Nazi references or anti-Semitic imagery. PewDiePie agreed that the material was offensive, but said he did not support "any kind of hateful attitudes". He once again used a racist word whilst live streaming himself playing a game.